Just a selection of our customer feedback…and we promise, none of them made up! Makes us feel really proud! Thanks for your help in finding me the perfect Seven guys. She’s now tucked up in bed back home. Lovely to meet you all too, keep up the great work! When I bought mine couldn’t have asked for better service and the follow up service is just as good . Tim and Andy have a great team and long may it continue. I recently part-exchanged my Sigma 125 for a Duratec R400 with Sevens & Classics. I’m very happy with the deal and service received. The R400 is currently back with them for a few bits & bobs to make it perfect, all being done with no quibbles. I bought my R300 from them a couple of months ago after much searching. They could not have been more helpful as (being a fussy sod) I wanted wheels/seats etc changed and fiddled with: no problem. Having dealt with the “motor trade” for many years I have no hesitation in recommending S & C.
Bought my current 7 from them and cannot recommend them high enough. A dealer with genuine customer focus! I was at Brands Hatch last Tuesday doing a track day and my alternator belt went. I called S&C and they told me to come straight round so they could take a look at it. 15 minutes later they had fitted a new belt and all was well again. Excellent service (Tim and Andy) – I would happily recommend them as not only did they sort me out but they also seemed like top, enthusiastic, helpful blokes. Very impressive !!! That’s really good to hear that Andy and Co. are really going the extra mile. I to have only heard very positive feedback from others about their experiences with S and C. Keep up the good work. I sold my 7 to Sevens and Classics and bought another one. Got it home, had my tea and was hoping to go out in evening. Starter motor fault meant I couldn’t. I emailed Seven and Classics at 8pm. Had two replies within the hour from their homes. Andy was at my house with a replacement starter motor by 11am and had it fitted by 1pm. I was very impressed with everything about them. I haven’t yet heard a bad thing said about them. Bought my first Caterham at the end of last year from Sevens and Classics. They changed the seats, lowered the floors and updated the roll bar. All done more quickly than I could reasonably expect and at the price agreed. Great service and a delight to deal with. I would thoroughly recommend them. And no, I have no connection; other than as a satisfied customer. I found Sevens and Classics to be knowledgeable, friendly and straight forward. Unlike Caterham they actually call you back and answer emails!They offer to “tailor” cars to your requirements if something you’re looking at isn’t quite the spec you’re after. I was there for the first time on Thursday looking for my first Caterham. Andy was very helpful and knowledgeable. Andy is an ex-director of Caterham. Great selection of cars and good location virtually track side at Brands. Hoping to return soon and come back with my first Caterham! I bought my 2nd seven through Sevens and Classics. All I can say is good words for them. Very nice people, always make you feel welcome and if there are any problems they have sorted them out for me straight away. I only have good things to say about them and would recommend them. Picked up my first Seven at the weekend from Sevens & Classics and in the process of signing up to the club as a member. Despite the weather I’ve managed to get out everyday so far and can’t stop grinning. Hi Andy, Now that i have calmed down a bit ( not ) I wanted to take time to thank you all for providing me with a beautiful car .I have never seen or stood next to a JPE before …so to own one is something very special. I am off to Beaulieu Supercar Weekend tomorrow to show the car and give passenger demonstration rides and share this iconic car with avid petrol heads. So thank you all again for making this special . Dear S&C, Wow! I can’t tell you how utterly enthralled I am with the Caterham Super Seven. That 30 year itch was worth the wait. What it can do and how it does it exceeds my expectations…I stare at in the garage and it makes me smile. I start it up anywhere and I grin like a Cheshire cat. But to drive it across the back of the Isle of Wight on a hot summers day is a dream come true. Please pass on my thanks to Andy and the entire team at Sevens and Classics. This is a truly special British sports car and I hope you continue to fulfil the dreams of people like me for many years to come. Just wanted to drop you a quick line to say that I finally managed to take the R500 out at the weekend and it drove absolutely superbly. Everything felt really tight, the steering tracked perfectly and the gearbox was spot on. Easily the best Seven I’ve driven! Can’t wait to take it round Brands. Thank you! It’s always a pleasure to come to S & C for work on my Seven as you know it is going to be done well by experienced engineers. You are also welcoming and open with everything. So thank you Tim and Andy and to your team for everything today. I had a great drive home in the sun and the car was running well. Thank you. Thanks so much for today. Amazing insight and direction from Callum. Best car dealer experience I’ve ever had. Just a quick note to say how happy I was today with the way the guys carried out my service. I was particularly impressed with Mike’s attention to detail when he was working on the car. Well it’s now been a few weeks since I picked up the Caterham. I absolutely love the thing – best fun I’ve had on four wheels. I thought I’d just drop you a line to say thanks to you and your team for all of your help. It’s much appreciated. And good job – it’s going like a dream. Many thanks and kind regards. Just wanted to drop you a quick email to say thanks for servicing my car – your chaps down there were spot on and did a great job which was very much appreciated; was great to be able to walk around the car and talk with them directly about it, very knowledgeable and happy to share their knowledge too. It was great, please do pass on my thanks. I also enjoyed the Sevens & Classics sticker placement in the engine bay. I didn’t even notice till I was working the car the other day! It will be staying there as a testament to your fine work! I just want to thank everyone at Sevens and Classics in helping me purchase my first Caterham 7. From my first contact with Callum I was immediately confident that I had chosen the right people to deal with. Throughout the purchase you helped and guided me through the process with great patience. I really appreciated everyone’s enthusiasm, professionalism and dedication. When I picked up the car it far exceeded my expectations – thank you very much. Spent the morning with a great bunch of guys at Sevens and Classics having a new heated screen fitted. They all know their stuff, are enthusiastic about Caterhams and charge a really fair price. I would really recommend Andy and Tim to anyone requiring anything to do with Caterhams. If your lucky, even the boss gets his hands dirty, not because they are short staffed, but because he enjoys it, how many other businesses do you find like that! Can’t recommend these guys highly enough. I bought my car from them earlier this year and totally enjoyed the experience. If you don’t know them then go and introduce yourself. Just picked up the Duratec R400 after having work done by ‘Sevens and Classics’ at Brands Hatch. Respray of body/wings after 8 years of stone chips and a little corrosion in the usual place along bottom of body. They also fitted throttle bodies which have transformed the smoothness of the engine generally. Really neat installation. A long journey down from Newcastle but highly recommended! I popped in just for a look while at Brands Hatch for the day, told them I was just having a look, really friendly, so much so I tried to buy a car from them at a later date but it had sold very quickly. True to their word, when they did find a car I may have been interested in they emailed me with the details. Good bunch of lads at S&C. HERBIEEEEEE !! Best dog in the world. Thank you Seven & Classics for checking my cooling system out at short notice. Special thanks to Brian Attwood for doing this and then explaining what was happening and putting my mind at ease. Cheers to all at Sevens and Classics! Just got home from picking my seven up after having an engine upgrade and lightweight flywheel fitted. As always the team were brilliant , I cannot recommend these guys highly enough! Thanks again. Andy, received bits yesterday. Thanks! Also for coolant advice. I’m soooooo grateful you and Team S&C have my back! Hey Guys, I just wanted to drop you both a mail to say how totally happy I am with the work you did recently. The engine upgrades are brilliant – loving that fruity little exhaust note and the crack and burble on the overrun is hilarious! – and the steering has been hugely improved. All of the vagueness on the straight has gone. I’ve got about 300 miles on it and will have about 600 by the time I get to the track day at Snetterton next week. Can’t bloody wait! I’ll be at the Silverstone Classic all weekend so if you guys are paying a visit then shout and I’ll come and hug you! My Seven passed its MOT today! Thanks Andy Noble and the guys at Sevens and Classics for all their help. A great team and highly recommended!..Although I was given the upgrade price list before I left which I can see is going to help me spend my pennies! Thanks for everything yesterday, I did about 50 miles yesterday evening and the car is running very sweetly, it even seems to fire up more quickly than before, so it must have been a faulty component from the outset. Your customer service and banter as always, particularly with the pick up and drop off timings was excellent. Once again many thanks. 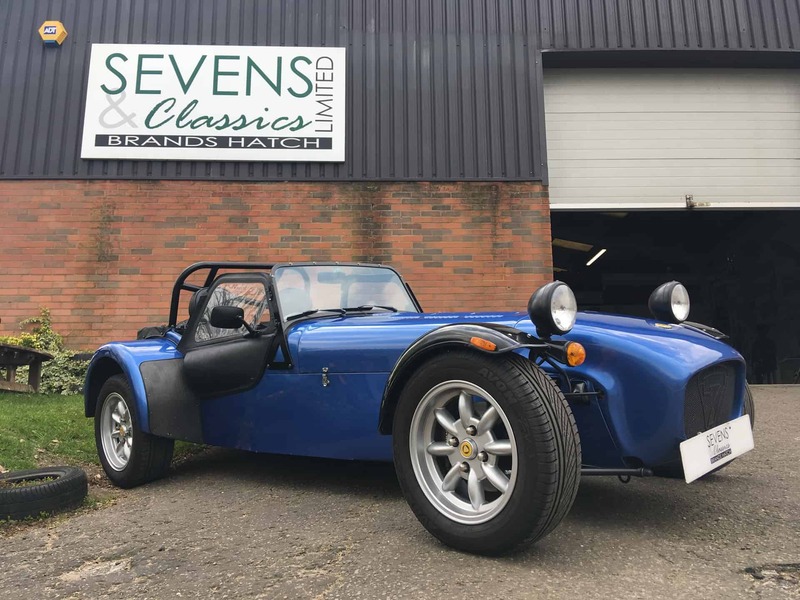 My thanks to Sevens and Classics for the excellent repair job on my Caterham after the White Van Man did his best to destroy her. From a sad state to perfect once again. Thanks to Tim Ward and Andy Noble for their patience with insurers. It was worth the wait! It’s now in the very capable hands of Andy, Tim and Callum at Sevens and Classics. ..cheers guys, you’re the best. Hi guys. Just want to say the setup was perfect. Track day was great. Thank you. Arrived at Sevens and Classics this morning to have a couple of oil seals replaced, only to find 5 club members already there! Enjoyed watching the track day with good company whilst my car was being fixed. Thanks again to Sevens and Classics for a good, efficient service as usual. As a first time Caterham owner I found the fantastic advice and guidance from the guys at Sevens & Classics just invaluable and I’m now an incredibly happy owner! A super team, wonderfully friendly and knowledgeable service and great tea too. I’m 100% confident in saying this was the most enjoyable car buying experience I’ve ever had and I can’t recommend them highly enough. I managed to get the car out yesterday for the first time for a proper try out since the upgrade……just one word “brilliant”. It feels like a different car and pulls from anywhere with no lag or flat spots. Please pass on my thanks to all the team, especially Mike who was fastidious in making sure everything was correct and done properly, it would have been so easy to cut corners regarding cable/plumbing routing etc but the engine bay looks perfect. Thanks for looking after my Seven and me this morning! Will be seeing you from now on for all my Sevens upgrades(!) and any work that needs doing. Thanks for the service, MOT and set up. Car is transformed. Won’t be going anywhere else from now on. Hi Callum, I had a good ‘blat’ (I’m learning fast!) home on Saturday and only got slightly rained on when I was about 15 minutes away from home but resisted the temptation to put the roof on. I made sure I stayed above 40 and we were fine! Thanks again for the level of care and attention paid to us. Got my R500 from S&C. Top team, great service. 100% recommend, you will not be disappointed. S&C are a pleasure to deal with and did a great job on my Prisoner Supersprint. S&C are a great bunch. Bought my 1.4 super sport from them. Cracking little revving engine. Definitely top bunch at S&C you won’t be disappointed! A great bunch with bags of enthusiasm, knowledge and experience. I bought my current 7 from them and I couldn’t be happier. A massive thumbs up from me. Have to agree, everyone over at S&C are amazing to deal with, really friendly, passionate about what they do and they know their stuff! I bought my 2nd Seven from them a few weeks ago, fantastic service, huge range of cars and very friendly. I had 1 minor problem and they sorted that out for me straight away with no quibble. If only all car dealerships were like these guys. I cannot recommend them enough. Thanks for sorting the car yesterday – drives great now and doesn’t sound like a Lancaster bomber. See you next time. Hi Andy, Just wanted to say thank you for sorting out my engine so quickly, and also for the excellent customer service you all give. Many Thanks for all that you and your team did for my Caterham, and for your wonderful hospitality!! I hope this won’t sound patronising, but it is great to see you doing so well, and I must admit that your customer relations are streets ahead of places I have dealt with in the past (including Official Porsche centres!). Had a great drive back, so glad I was lucky with the weather. Look forward to seeing you again in the future. Big Thanks to Sevens & Classics Ltd who did a fabulous job curing some bad drivetrain vibes on my 1991 Prisoner Seven. Can’t recommend their super-knowledgeable and friendly service highly enough. Thanks to all at Sevens & Classics especially Callum! The drive home was epic. A big big thank you to Sevens & Classics and especially to Callum for enabling me to finally realise a life long dream. 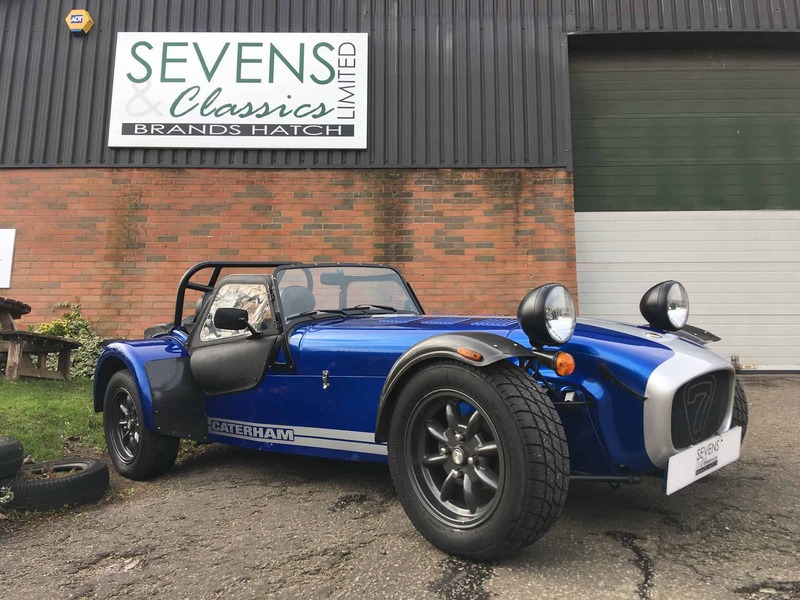 Sevens & Classics professional and dedicated approach to customer care is second to none and are without doubt the place and the right team that anyone looking for a Caterham should go to. I do not feel that I have purchased a car but more like I have joined a family. If you look at my car history, I have had a lot of different cars and hence a lot of different buying experiences. You can get good and bad experiences at many levels of the market when buying. The team at Sevens & Classics were at the level of enthusiasts rather than product sales. They put lowered floors in, changed the seats, put on an FIA roll bar and a power source for the Tom tom. All in 4 days so that I could go to a Goodwood meet. When there was a slight issue with the car they picked it up from my drive way , sorted it and had it back with me within hours. The difference between this along with their willingness to discuss/chat/debate different models and options is well beyond customer service and is into enthusiast territory. It was the most fun buying experience I have had in 40 years of getting new cars for family or myself. Currently in the market for my first Seven and popped down to S&C last week. Andy spent a good hour with me, very impressed with their passion. Another big thumbs up for Andy and Callum. I’ve just sold my Superlight through them and the process was very very easy and pain free. So much easier than dealing with all the test pilots and tyre kickers. Another thumbs up from me. I sold my limited edition Roadsport through them earlier this year and the service was excellent. I couldn’t recommend them highly enough. Thanks for your patience yesterday and for making our visit a pleasant one. I’ve never had such a great time buying a car! I thought I would drop you a quick email to let you know the funds for the Caterham are already in my account and to thank you again for the excellent service and speedy sale. I would be more than happy to write a testimonial for your website if you would like me to. I have found dealing with yourself and Sevens and Classics as a whole an excellent experience and couldn’t recommend you highly enough. Thanks again for a very fast and easy transaction. I really like your style as a company by the way, great to meet to Callum today, you may have a lifelong customer here….. No need for a heater, the engine heat today left me like an extra from ‘Bridge over the River Kwai’ by the time I got home. Mrs #### likes your loo by the way…… Always a good sign. Had a brilliant time driving the 300 miles home. Never missed a beat. First time I have ever driven a Caterham and safe to say I am absolutely hooked. The car is excellent and I would just like to say thanks for the help and advice and thorough handover. I will recommend your business to my colleagues and am very pleased that I bought a car from people who clearly understand and love the brand and what makes the cars so special. I wish you every success in your business. If I lived nearby I would probably drop in every week just to look at your stock ! Hi Callum and Team, A big thanks to Tim for delivering the battery – that really is ‘over and above’ customer service! !